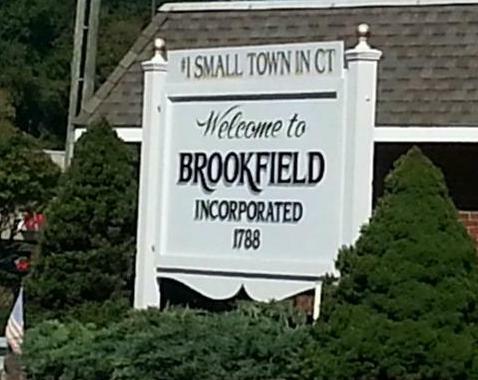 Brookfield is a delighful town, rich in history, beautiful homes with access to Candlewood Lake and Lake Lillinonah. It has been voted as Connecticut's #1 small town (voted by Connecticut Magazine) and this has to do with quality of life, schools, access to shopping, restaurants etc. There's an area that comprises all the shopping including warehouse style big shopping, miniature golf, pet store, grocery stores, car dealers, Stew Leonards Farm Market, fast food, casual eateries with al fresco dining, gas stations,marinas, Starbucks and even a restaurant named "Down the Hatch" where you can drive your boat right up to the restaurant, dock and go inside for a bite to eat. Boating, sailing, waterskiing and tubing are some of the other favorite activities of this town. The rest of Brookfield is quiet and residential. You will enjoy beautiful water views while driving around the Lake, giving you that vacation feel. Lots of fun at the beach, swimming and boating are regular activities for these lucky residents and their families. Settle into a great ranch style home on lovely, level lot in a popular neighborhood near Candlewood Lake. So convenient to EVERYTHING! Living room with space for dining area plus eat-in kitchen with SS appliances and slider to backyard activities including fire pit. Lower level has tiled flooring throughout, and 2nd full bath, offering an option for in-laws or teen living. This space simply provides great space to spread out: family room, office or fitness space plus second laundry hook ups. Newer windows. New water tank. Fully fenced back yard for pets or little ones. Variance is on file with Town Hall to build garage. Shed is available for storage. Special financing: No Loan Fees. Come make this one your own! Original owners' pride shows through out this meticulously maintained home. Beautifully designed 7 room ranch has sun-filled rooms all with hardwood floors and C/A. The spacious family room extends off kitchen with vaulted ceiling, skylights, fan, and large bay window. French doors lead to screened porch with tile floor & skylight looking out on backyard which flows into private wooded protected open space. Kitchen has new SS appliances and large pantry. Living room is warmed by gas fired fireplace. Full basement has additional FP. Front deck of diagonal wood welcomes guests. Many plants and flowers for seasonal discovery in pathed garden area. Convenient laundry/mud room between 2 car garage and side door. Quiet road, cul-de-sac, yet only 1.5 miles to 84 and new Still River Greenway. This is a gem - come and fall in love. Open House Sunday 12 - 3. Views of Candlewood Lake from this home are stunning! Across the street from the lake and just steps away from the beach you can look out from almost every window in the home to see gorgeous views of the lake. Rustic charm and character add to the warmth and coziness of this well kept home. The gorgeous stone fireplace in the living room leads to a den (or could be a master on the main) and full bath. The cozy family room has lake views from all angles and leads to the kitchen and dining area. Slider leads to a composite deck for easy grilling and entertaining. The level backyard is a unique feature of this home. Wake up to the sunrise in the open and airy second bedroom or fall asleep to moonlight in the large master bedroom. The sunsets are breathtaking from the front of the house and master bedroom. The full basement is partially finished with garage access. There is also a cedar closet on the lower level, a laundry area and a tool bench/craft area, too. The one car garage and private driveway add priceless parking space and there is plenty of room to park along the street for guests. If you are dreaming of lake views and walking to the beach then look no further. This is the home! The district tax covers the community club house, community events at the beach, road maintenance and spring/fall brush pick up. Community well adds piece of mind with monthly water test reports. Beautiful 4 bedroom colonial situated on a flat peace of land. Minutes to shopping and I-84 but set back in nice neighborhood. House has newer bathrooms and kitchen. With stainless steel appliances. There is a fire place in the living room. Hard wood floors through out the house. Full Unfinished basement waiting to be finished and add that extra space to the home. This one is a keeper! This charming Cape located on a cul-de-sac is the one you have been looking for! Located just 2 miles from Brookfield Town Park where you can swim in Candlewood Lake, play volleyball with friends and enjoy long summer days. Beautiful eat in kitchen with granite countertops, stainless steel appliances, hardwood floors and bay window. Living room with hardwood floors and fireplace. Enclosed, screened sunporch leads to the patio and park-like back yard with fire pit. Main level master bedroom with full bath. Partially finished lower level. New furnace and oil tank in 2018, new water softener in 2017. Brand new septic! Great commuter location - just minutes to I-84 and close to shopping! Set amid Brookfield's Historic District, this property is one of a kind. Built ~1820 as a barn & totally restored in 2009, it's an unexpected blend of antique & modern stylings. Orig vintage details incl hrdwd wide plank flrs, exposed beams, brick frplc w/wood storage cubby, built-ins, & expansive 2nd flr landing/sitting area. Sleek & clean w/an abundance of natural light, the living space resembles a layout in Architectural Digest. Quality craftsmanship creates a home that's functional, energy efficient, as well as a source of pride. Foyer w/rich hrdwd flooring, high ceiling, & staircase. French doors to the LV w/brick frplc. Center hall leads to the very heart of this home: a vibrant gathering space that incl a FR, dining area, & KT. An open concept design allows an effortless flow for entertaining & a comfortable rhythm for daily life. The kitchen is…magnificent. Custom cabinets, granite counters, Viking stainless steel gas range, ample storage & workspace, farmhse sink, large island w/prep sink & breakfast bar. Walls of windows envelope the FR & dining area w/French doors to an amazing 680 sq ft IPE deck w/propane hook-up for grilling. BR w/built-ins & access to hall's full bath completes 1st flr. Upstrs MB features vaultd ceiling & gas fireplc. Sumptuous master BA incl carrara marble, soaking tub & shower w/rain shower systm. 2 addt'l BR & 1 BA w/dbl sink vanity. An exceptional home. Prime location in center of town: front row seats to annual Memorial Parade festivities! Quiet and serene setting in desireable Brookfield location. minutes to I84 RTE 7 and the increasingly popular 4 corners. Contemporary with lots of character and plenty of property to compliment. Large stone fireplace with cathedral ceilings, picture windows, and skylights for optimal sunshine. walkout slider to huge wrap around deck for entertaining or relaxation.